NE OH: Stark County - From starkparks.com, "Class 1 e-bikes are permitted to ride on multi-purpose trails (crushed limestone or asphalt) as part of a pilot program throughout 2019. The speed limit for all users 15 mph with signs posted along the trail." NE OH: Stark County - From starkparks.com, "Flooding along the trail is present in the low lying areas including north of Lake Lucerne near Canal Fulton, under Lake Ave. in Massillon, and Wooster St. in Navarre. Crystal Springs, Lock 4, and St. Helena Heritage Park parking areas are also closed at this time"
SW OH: Columbus - From Columbus MetroParks, "Severe flooding and debris blocking majority of Alum Creek Trail. Will clear by tomorrow afternoon when flooding has subsided. Stay Safe!" NE OH: CVNP - "The Towpath Trail between Deep Lock Quarry Metro Park and Hunt House is now open! 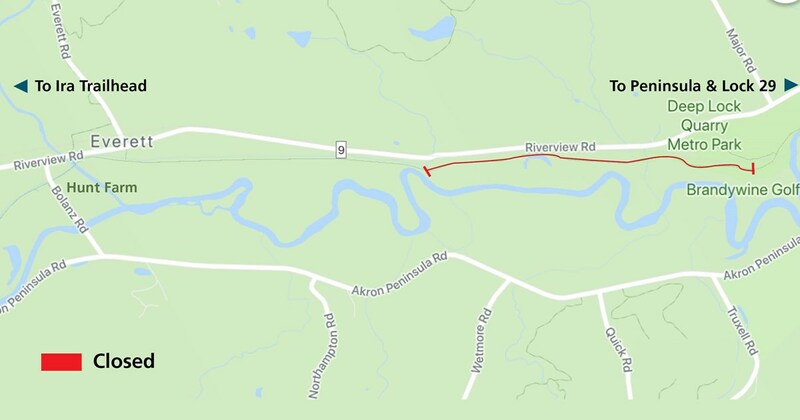 NE OH: Canal Fulton in Summit County - From starkparks.com, "The trail will be closed between Butterbridge Ave. and Lock 4 Trailhead [a 1.3-mile segment] on March 19, 2019 for tree work along the trail." NE OH: Barberton - From summitmetroparks.org, "The Towpath Trail from Manchester Road to Snyder Avenue will be closed weekdays from 7 a.m. to 4 p.m. for up to three weeks while the U.S. Army Corps of Engineers begins work to prepare for the installation of Asian carp barriers." SW OH: Columbus - From MetroParks, "Please be aware of flooding on the trails. Take care and do not ride through standing water if you do not know the depth. Stay safe." NE OH: Stark County - From starkparks.com, "Water from the Tuscarawas River is flooding the trail near Lake Lucerne Trailhead, Lake Ave. Trailhead, and Craig Pittman Trailhead." NE OH: Summit County - From summitmetroparks.org, "The Towpath Trail's Clinton Trailhead parking lot and the trail south to the county line is closed due to flooding." SW OH: Columbus - From MetroParks, "Camp Chase Trail: snow drifts are covering trail making it unsafe from Battelle Darby Creek to Wilson rd. Please be careful out there." NE OH: Stark County - From Stark Parks, "Flooding over the trail has closed several spots. Expect varying trail conditions at Lake Ave. in Massillon, north of Lake Lucerne near the Summit County line, and Wooster St. near Navarre." NE OH: Cuyahoga Valley National Park - There's no word yet on exactly how the government shutdown may affect the 20-miles or so of towpath trail and Ohio-to-Erie Trail through Ohio's national park in the Cuyahoga Valley. Based on shutdowns during the previous administration, here's what you can expect: The trail should be open, but some (or all) of the facilities may be closed, as staff may not be available to maintain them. 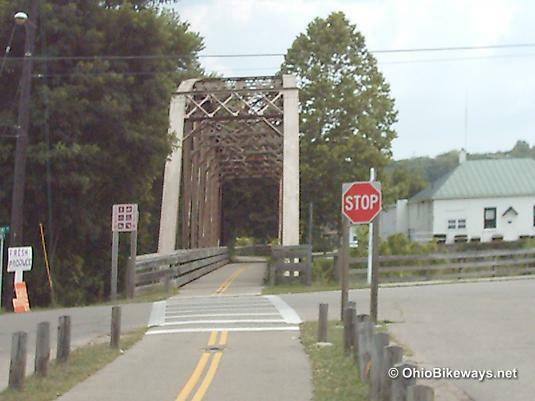 NE OH: Peninsula - From NPS.gov, "The Towpath is closed between Deep Lock Quarry and Hunt Farm [in the Cuyahoga Valley National Park] for bridge replacement through early spring. There are no detours available." NE OH: Akron - From Summit Parks, "Due to flooding, the Towpath Trail is closed from the Stark County line to just south of the Clinton trail head, and a half-mile from the Center Road parking lot." NE OH: Massillon - Stark County Parks advisory: "Consistent rainfall will likely close the trail in low areas due to rising water in the Tuscarawas River by 11/2/2018. Water over the trail has closed the underpass at Lake Ave. in Massillon." NE OH: Massillon - From starkparks.com, "The Towpath Trail will be closed between Cherry St. and Lincoln Way on Saturday, Sept. 22 from 6 a.m. to 2 p.m. for sewer work." NE OH: Stark County, OH - Towpath Trail: "Several inches of rain over the weekend have flooded many sections of the trail. The trail is closed until further notice." SW OH: Warren County, OH - "The trail between SR 350 and Strout Rd. [a 2.3-mile section] in Warren County will be completely closed September 17-21, weather permitting. There will be no safe passage through the construction area for this period of time. Crews will be milling the old asphalt and paving the newly rerouted trail." NE OH: Summit County, OH - From Summit Metro Parks, "Beginning Monday, 9/10 and continuing for approximately one week, the Ohio Department of Natural Resources will be cutting weeds in the canal along the Towpath Trail. This work will include some temporary trail closures on the section of the trail just south of the Manchester Road Trailhead." SW OH: Columbus, OH - From Columbus MetroParks, "Please use caution. Flooding and storm debris along sections of trails. Crews conducting clean up." NE OH: Peninsula, OH - Construction work along the towpath in the Cuyahoga Valley National Park, just south of Deep Lock Quarry, has resulted in a temporary bridge installation on the trail. This will allow trail users access to this section while plans continue for a more permanent structure. Please walk your bike across the bridge and allow for one-way traffic. NE OH: Barberton, OH - From Summit Metro Parks, "The Ohio Department of Natural Resources will be completing tree work between Manchester Road and Snyder Avenue in Barberton. The work is expected to continue until approximately 7/20/18, and temporary [towpath] trail closures will be in effect during this time." 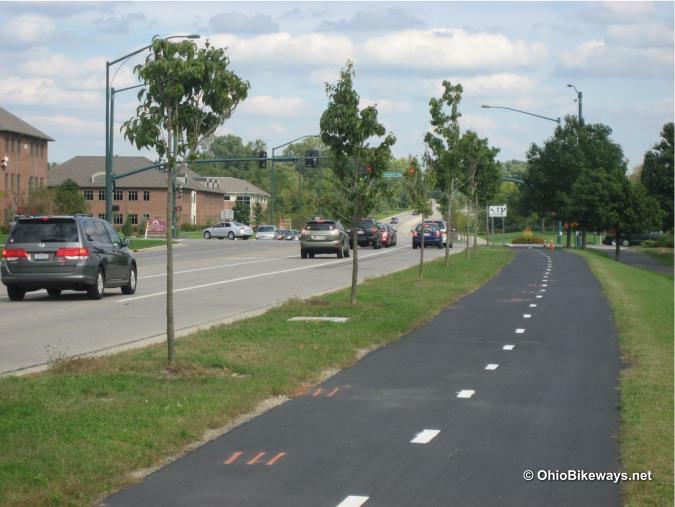 SW OH: SW Columbus - Friends of the Camp Chase Trail - "The majority of the construction of the Camp Chase Trail Connector project along Sullivant Ave and Georgesville Rd is done. There is a short section missing to the north of (eastbound) Sullivant Ave across the railroad tracks to connect to the Camp Chase Trailhead on Georgesville Rd. That last segment is coming soon with construction later this year." "Industrial Mile is still the designated Ohio to Erie Trail route between the 2 trail segments, until completion of the shared-use path across the Railroad crossing." NE OH: Summit County - "The City of Akron will be repairing a retaining wall along the Towpath Trail near Beech Street. Construction will begin on July 9, and the trail will be closed for 10 to 12 weeks between Beech and North streets. The City of Akron will post detour signs." SW OH: Warren & Greene Counties - "Construction projects [on Little Miami Trail] between Strout Rd and SR 350 [2.3-mile section south from Rt. 350 near Fort Ancient in Warren County], and between New Burlington Rd and Roxanna New Burlington Rd [4.3-mile section between Corwin & Spring Valley] will begin mid-July. NE OH: Stark County, OH - From starkparks.com, "The Towpath Trail is closed due to high water and flooding at Lake Ave. in Massillon..."
NE OH: Stark County, OH - From starkparks.com, "The Towpath Trail is closed due to high water and flooding at the following trailheads: Lake Lucerne to the county line, Lock 4, and Crystal Springs. Water is expected to rise and also close Lake Ave. in Massillon and Wooster St. in Navarre..."
NE OH: Stark County, OH - From starkparks.com, "From starkparks.com, "Water is over the trail in many areas, including Lake Ave., Wooster St., and north of Canal Fulton. Rising water is expected in more areas of the northern Stark County section. We urge everyone to use caution when heading out on the trail." NE OH: Clinton, OH - From summitmetroparks.org, "The Towpath Trail is closed north and south of the Clinton Trailhead due to flooding." SW OH: Columbus - MetroParks also reports flooding on the Alum Creek Trail. NE OH: Stark County, OH - From starkparks.com, "Water is over the trail at Lake Ave. in Massillon and is expected to flood over other lower areas in Stark County over the weekend." SW OH: South Lebanon, OH - "The [Little Miami] trail will be closed at the State Route 48 overpass near South Lebanon beginning March 26 as ODOT works to fix the washout issues. This work is scheduled to last 5 days." NE OH: Clinton, OH - From summitmetroparks.org, "Towpath Trail is closed north and south of the Clinton Trailhead due to flooding." NE OH: Canal Fulton, OH - From starkparks.com, "High water has closed the Towpath Trail at Lock 4 Trailhead. Other low areas might also be under water soon..."
SW OH: Miami Twp., OH - From Friends of the Little Miami Trail, "...we are aware of the rock slide under 275 [3 mi south of Loveland] between Bridge St and Beech Rd in Clermont County. ODOT has agreed to help us get that cleared off. SW OH: This alert is from Columbus MetroParks today. OH: Flooding can be found across the state, so Ohio-to-Erie Trail travelers should also expect flooding along the Towpath Trail, as well as other low-lying trail sections. NE OH - From starkparks.com, "Flooding has closed the Towpath Trail in Stark County until further notice." NE OH: Stark County - From starkparks.com, "The northern section of the Towpath Trail from Lake Ave. to the Summit County line is closed due to high water and flooding. SW OH: From Columbus MetroParks - There are 4-5ft. snow drifts on some sections of the Camp Chase Trail. Please use caution in these areas. Location: This cross-state trail will extend from Cincinnati to Xenia, on to Columbus, then Akron, and finally Cleveland near Lake Erie, when completed. Lodging: Overnight accommodations along the Ohio-to-Erie Trail route. Worth Noting: Finished trail sections, though mostly asphalt, do include other surface types such as compacted crushed stone towpath & asphalt with chip-n-seal top coat. The Ohio-to-Erie Trail, or OTE as it is commonly called, begins on the Ohio River in Cincinnati. The ~320-mile trail route extends northeast through Xenia Station, then Columbus, Akron and on to Cleveland where it ends near Lake Erie. It's important to understand that this lengthy route uses different bikeways (with different names!) to make up its route. So, if you decide to ignore that fact and simply follow the Ohio-to-Erie Route 1 signs instead, don't be surprised if you occasionally ride off course. Completion of the OTE is set for 2020. At this time, roughly 85% of the trail has been completed. Ed Honton was the founding father of the Ohio-to-Erie Trail concept in 1991. By taking advantage of existing trails, like the Little Miami Trail, the focus was put on bridging gaps between existing trails. The strategy proved successful. By 2005 roughly 70% of the trail was completed. But that still left ~95 miles to be built in many different parts of the state. Some of those segments would have to cross industrial zones, where trail building is expensive and trail routes are often hard to come by. Fortunately, in some places rail corridors were still available along the route. But in others, portions of a corridor could no longer be converted, or they simply didn't exit, such as along the Alum Creek Trail. In those early days of the project, optimism ran high and the initial projection for completion of the trail was 2003. After that year came and went it became obvious that those early projections were used as a motivational tool. After all, in 1991, who would have been excited about completion in 2020? Trail advocates all across the state needed to get onboard in a big way in order for a project of this scale to be built. And some wise folks, like Ed Honton, knew how to dangle a juicy carrot. Let's take a look at the route from south to north. The official endpoint along the Ohio River is the Purple People Bridge that crosses over into Kentucky. For a trail that uses some of Ohio's best bikeways, this is a most appropriate endpoint. Not a dead end, mind you, but rather a connection to another state! On the Ohio-side of the Purple People Bridge, you're onboard the Ohio River Trail. Heading east toward Lunken Field, the OTE utilizes an on-road bike lane for about 2.5 miles between trail segments. Finished trail then connects with a segment of the Lunken Field Trail at Wilmer Avenue. A connector trail at Lunken Trail, named 'Armleder & Lunken Connector' (on Google maps), continues along the Little Miami River and passes underneath Rt. 125 (Beechmont Ave.). This connector, before it turns away from the river, is on the bank opposite of where the Little Miami Trail currently ends. Once this final connection is made, it will eliminate more road riding that's required here. Once aboard the Little Miami, the fun begins. The next stretch of the OTE is all trail, an uninterrupted 58.5 miles to Xenia Station. [The bikeway is mostly continuous, with little road riding for the next ~115 miles into Columbus.] This stretch brings back memories of my 2004 OTE adventure. Though I had to deal with thunderstorms that day, there were no navigation worries when all you have to do is follow the main trail. From Xenia Station, turn east and take the Prairie Grass Trail in order to stay on OTE Rt. 1. It's a pretty straight shot past the next 3 towns along the route, Cedarville, South Charleston and London, OH, with short road sections to traverse in each. You'll tick off another 30.6 miles along the way. Due east out of London, the bikeway remains the same, although you'll be riding on Roberts Pass and then on the Camp Chase Trail as you make your way past Lilly Chapel en route to Darby Creek Metro Park. Exiting the Darby Creek valley, the trail turns northeast once again as it passes through Galloway heading for Columbus, OH. Two more short road rides along this stretch, the last of which connects with the 'Hilltop Connector' (on Google maps). 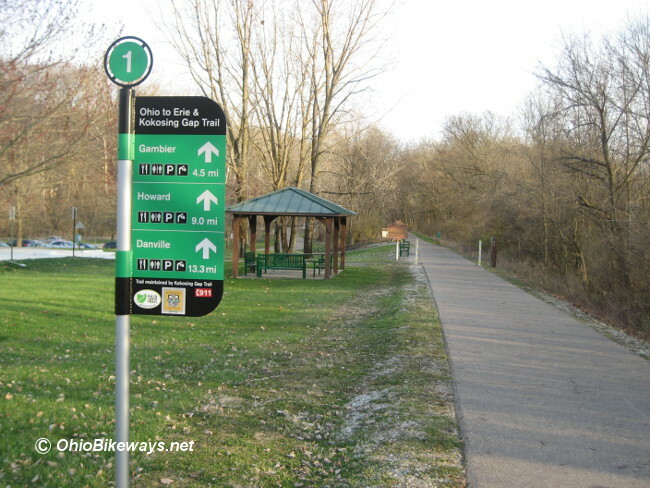 This short trail segment crosses the Scioto River and deposits you on the Scioto Trail near I-670. Once onboard the Scioto Trail, you've completed 22.4 miles since leaving London. A mostly eastward ride, but you will briefly circle back to cross a bridge. Then it's over to Confluence Park on the north bank of the Scioto River, where you'll pass by the Olentangy Trail junction. Continue east alongside the Scioto over to North Park Pavilion at Neil Avenue & W. Long Street. Turning north on Neil, you're now on the Downtown Connector. The next 1.5 miles is a combination of wide sidewalks, bike lanes, sharrows and/or unmarked road riding. The Ohio-to-Erie Trail website recommends taking Neil and turning east on Nationwide Blvd to Mt. Vernon Ave. to Cleveland Ave. north to rejoin the trail (wide sidewalk) at Jack Gibbs Blvd. This next 2.8-mile trail section takes you east to the Alum Creek Trail where you turn north. But before you return to laid-back chill-along-the-trail mode, you should know that the Downtown Connector has a history of reports of broken glass along its route over the years. So consider yourself warned. 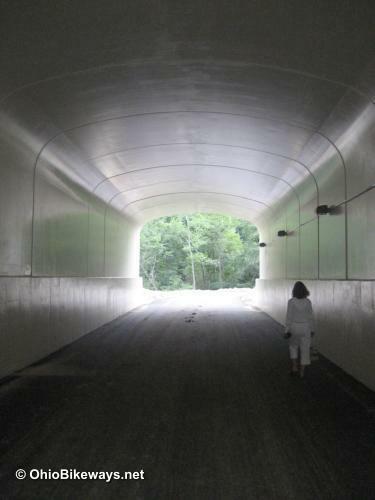 Once on the Alum Creek Trail, it's an 11-mile northbound journey to W. Schrock Road. To take the most direct route through the suburb, turn east and jump on the Schrock Road bike lane over to Charring Cross Drive where the OTE picks up again, heading north. A little further along this route, you'll pass the Bike Hub at Hanby Park just south of E. Park Street. If you have some extra time on your OTE journey, Westerville has a well-developed trail network of its own to explore. That includes a trail over to the southern part of Hoover Reservoir. Another 8.3 miles north on the OTE takes you along the Genoa Twp. Trail and the Hoover Scenic Trail , which skirts the northern tip of the reservoir before ending at Wiese Road near the Old 3C Highway. Continuous trail runs out here. And the next three OTE segments are short, disconnected sections that are still under development. For that reason, the official OTE route takes to the road here to bypass all three for now. The 12.4 mile road ride continues on the Old 3C into Sunbury. Then a short jaunt to the east over to Hartford Road to head east to Downing Road. North on Downing, which becomes Huffman Road before the route meets up with finished trail again southwest of Centerburg. This is a significant point along the route, simply because a nice chunk of finished trail awaits you on the next leg of the journey. The tarmac stretches another 42.6 miles into Holmes County via the Heart of Ohio Trail, Kokosing Gap, Mohican Valley, and Holmes County Trails. For those riding the OTE out of Columbus, the Mohican Valley Trail marks the first trail where you can encounter horse-and-buggy travelers. And when horses share the trail, that means you may see a thin chip-n-seal topcoat at any time. As of Nov 2017, the topcoat has been ground down here by hooves and buggy wheels to reveal smooth asphalt. However, it may be reapplied at any time to help protect the asphalt surface. 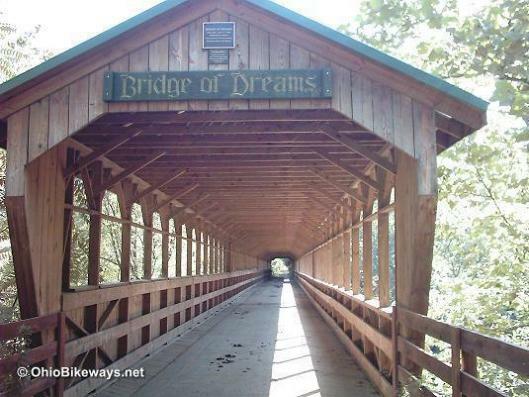 The Mohican Trail is also home to the iconic Bridge of Dreams, one of the highlights along the route. This 370' covered bridge is reported to be the 2nd longest in Ohio and the 3rd longest in the nation! Just before entering the tunnel under Rt. 62, you enter Holmes County aboard the Holmes County Trail. As of November 2017, new paved trail now extends 7.4 miles to Clifton Street in Glenmont, Ohio. From Glenmont east to Killbuck the corridor is closed. This section is the final missing link in completing the 29-mile Holmes County Trail portion of the Ohio-to-Erie Trail. The land has been acquired for trail use, but clearing and construction has yet to begin. So, the only alternative here is a road ride, most likely on Rt. 520, an 8.1-mile ride on the most direct route into Killbuck. Another swath of asphalt bikeway begins on the northside of Killbuck. After a few miles, the trail turns north and becomes double-wide, revealing the original configuration intended for the Holmes County Trail, a separate trail for horse-and-buggy use. From Killbuck, the pavement extends 15.8 miles over to Fredericksburg in Wayne County. From Fredericksburg, it's a northeasterly 17.3 mile road ride that features the most challenging terrain along the entire OTE route. Check out this section elevation profile. It's back to flatter terrain when you reach the Sippo Valley Trail and ride east, though the trail does have a short climb. It's worth noting that about 5 miles of the Sippo Trail has a stone surface. Take note, those with skinny tires, as the stone may not be as small or as compacted as the towpath that lies ahead. Important Note: For those unfamiliar with riding towpath, this is an unpaved, compacted crushed stone surface. It will support skinny tires (watch out for loose areas). But towpaths are low-lying areas prone to flooding. If you plan your ride during or just after major rain events, you may face closed sections and/or a sloppy trail surface. 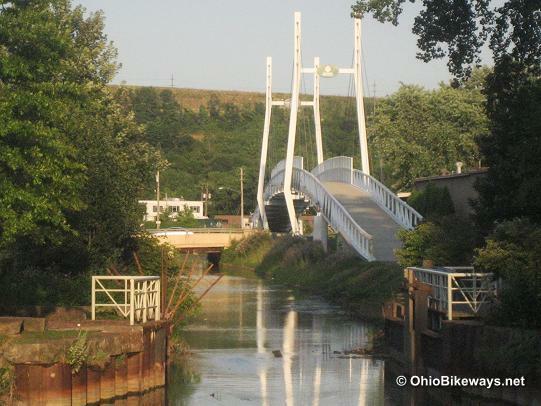 After your 10-mile ride on the Sippo Trail, the towpath will lead you to the finish line near Lake Erie in Cleveland, OH. The Sippo and towpath combine for 72-mostly contiguous miles to Harvard Avenue in Cleveland. The only off-trail riding you may encounter is due to a construction closing, like the sewer construction project in Akron, OH. Fortunately, that detour is only a 1-mile road ride, but it will be in effect into 2019. This last big chunk of OTE has some surface changes that vary between towpath, asphalt, boardwalk and even a bit of asphalt with chip-n-seal. The due east path along the Sippo changes to northbound when you reach Massillon and turn north on the towpath. The northward track continues through Canal Fulton, Clinton, Barberton and Akron. After a little urban and industrial landscape, the towpath disappears into the heart of the Cuyahoga Valley National Park for about 20 miles or so, the route finally bending ever so slightly to the northwest, which will be its general heading the rest of the way. About the only thing that may dampen your ride in the CVNP (besides rain), is if you happen to ride through during the towpath's busiest time -- a perfect weather weekend. Trail users can come out in droves here, so if you're timing is bad, expect your attention to be focused firmly on the trail ahead, rather than taking in the surrounding landscape. At Rockside Road in Independence, OH, the trail enters the Cleveland Metroparks jurisdiction and the trail surface turns from towpath to asphalt for the rest of the journey. Two over-street bridges here (one pictured above) allow riders to avoid a couple of busier intersections. The OTE soon comes to Harvard Road, about 5 miles from its eventual terminus. Though the trail ends here, there are two separate, completed trail segments further north. The closest to Harvard is Steelyard Commons, a 1-mile section that is being extended in 2017 another 1.9-miles to the north. It will be just short of the Scranton Flats segment, which is .6-mile long and the furthest completed northern section. About 1/2-mile north of Scranton Flats will be the future Canal Basin Park, the Ohio & Erie Towpath's northern terminus. Though the towpath will end there, a connector to Lake Erie is already in the works for the OTE. The Centennial Lake Link Trail will make that final connection. Recent construction of the Lake Link Trail (2017), a .4-mile finished segment, extends from the southern end of Scranton Flats over to Columbus Road. When completed, this will be the connector for riders looking to dip their wheels in the lake to officially end their cross-state ride. But completion for the Cleveland-area towpath & OTE is at least a year away 2020, if not longer. So for now, brave riders itching to complete their rides will have to take to Cleveland streets to do so.